For decades, we've been told that positive thinking is the key to a happy, rich life. Drawing on academic research and the life experience that comes form breaking the rules, Mark Manson is ready to explode that myth. The key to a good life, according to Manson, is the understanding that 'sometimes life is messed up and we have to live with it'. Manson says that instead of trying to turn lemons into lemonade, we should learn to stomach lemons better, and stop distracting ourselves from life's inevitable disappointments chasing money, success and possessions. It's time to re-calibrate our values and what it means to be happy: there are only so many things we can worry about, so we need to figure out which ones really matter. 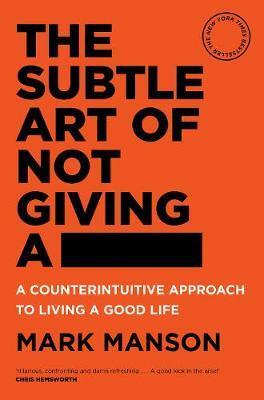 From the writer whose blog draws two million readers a month and filled with entertaining stories and profane, ruthless humour, The Subtle Art of Not Giving a ___ is a welcome antidote to the 'let's-all-feel-good' mindset that has infected modern society. Mark Manson has spent a number of years studying the academic research on things such as happiness, passion, goals and relationships, publishing his views online as well as in Forbes, CNN, Vice, TIME, Vox and The Huffington Post. Mark shares his philosophy through articles on his wildly popular Internet blog, markmanson.net. Mark lives and writes in New York.